Can all action games just go ahead and default to the scheme popularized by the Arkham series? Can we just make that official? For years upon years, as far back as the 16-bit era, action games that are heavy on melee combat have used the same default command layout: light attack, heavy attack, possibly some kind of stun move, a dodge or other defensive move, and a few incidental differences until being solidified in God of War. Quickly pressing attack buttons in combinations gave you multi-hit combos, often with the capability of swathing through large crowds of enemies or taking impressive chunks off of bosses' life bars. While these games had you whipping out visually impressive and viscerally satisfying screen-filling dances of destruction, the sad fact of reality is that the basic combo of light attack, light attack, heavy attack was often the most useful combo in the game. It was quick, required little dexterity, and was reliable in its simplicity. Sure, the ten-button strings that required split second timing may have looked amazing and racked up your hit counter, but for games often known for their brutal difficulty, staying alive is what mattered. As any survivalist will tell you, simple and reliable tools trump flash and dazzle when your primary objective is to stay alive and your secondary objective is to not die. Brawlers weren't always like this: as any child of the late '80s and early '90s with fond memories of Final Fight and Streets of Rage will testify, there was a time when gamers could take down all matters of organized crime and evil monsters with just two buttons: attack and jump. There was not element of skill to these games, despite their simple controls. Special attacks required button combinations, demanding more dexterity. But these moves actually had a tactical use: clear the area around you of enemies. Throws and holds required simply making contact with a hostile character, tilting the joystick (or control pad) left or right, and hitting the attack button. They dealt heavy, direct damage, giving a decent reward for their high risk of getting right in the bad guy's face despite being mechanically simple. These games were fun and challenging despite lacking pages and pages of combos, special moves, counters, and finishers. So why do modern action games have such extensive controls? Part of the answer is "because they can." Technology and software engineering has advanced. We now have machines that can crunch exponentially more code to make a staggering amount of calculations, and our game pads now have a minimum of eight buttons. Why not use that horsepower to give the player more options, more empowerment, and more spectacle? The problem: spectacle is usually all we get. Yes, mastering the top-tier combos in God of War can make certain encounters easier, as the character deals out more damage in a comparable amount of time, but they also make defense trickier to navigate because they plant Kratos squarely in place. So, players go back to what they know: light, light, heavy. We end up with more than we need. That's nothing bad, necessarily, but it also leaves the player feeling like they're missing out, like they're not using features in the game they paid $60 to play. It also makes combat dull and repetitive, not a good thing in a game where combat is pretty much all there is. Enter Batman: Arkham Asylum. Batman, as anyone knows, is the most accomplished martial artist in his fictional world. If any character could justify their own special controller with 32 buttons and memory for 100 macros, it would be this guy. Yet, when the demo for Arkham Asylum hit and most gamers got their first taste of combat with the Dark Knight, they found it—I hate to say "easy"—streamlined. One button to attack, just like the old days. One button for counters against attacking enemies. A double-tap on the button that made Batman run initiated a defensive move; a vault if heading toward an enemy, a roll otherwise. And there was one button for a quick stun move that gave our hero some breathing room. It's not that different than the set-up we are all accustomed to, except for one major difference: there's only one attack button and two defensive buttons. The focus has been moved to defense, especially when you throw in the stun button. Also, there are no complicated command strings for mega combos. Combat in the Arkham games is based less on waiting for the opportunity to unleash massive damage in between static blocks and rolls, but more about movement and positioning, timing and precision. A counter keeps Batman safe from harm while still damaging the enemy, and it's executed with a single button, but requires situational awareness and a hair trigger. A roll or vault keeps your hit counter going, making your defensive maneuvering equivalent to your offensive maneuvering. Piling on damage on a single enemy is secondary to landing a quick hit on one foe before dashing to another one. The combat in Batman: Arkham Asylum is less about planting your feet and bashing faces one-at-a-time, but staying mobile and versatile. This requires more skill than the simple button layout would imply, and the focus on defense means that the player can more easily take advantage of openings and prioritize targets. Speaking of prioritizing targets, once the player unlocks the takedown moves, another degree of skills is piled on. Ideally, these would be used against the biggest threat in an encounter, but your positioning may not be such that the player can target them. This means they must continue dodging and fighting until it is, so they can keep their hit counter rolling lest they lose that takedown move. The takedown itself requires some dexterity, having to press two buttons at once (just like in Final Fight; also, like in that classic, the special attack serves an identifiable purpose that actually works to the player's advantage in a meaningful way). This should be the standard for action games, and any game featuring heavy individual combat, here on out. Some games, such as The Witcher 2 and the Dark Souls series, hang on to the old light-heavy set-up, and while combat in those games is still fun, it definitely feels clunkier and less responsive than in Arkham Asylum and its sequels. 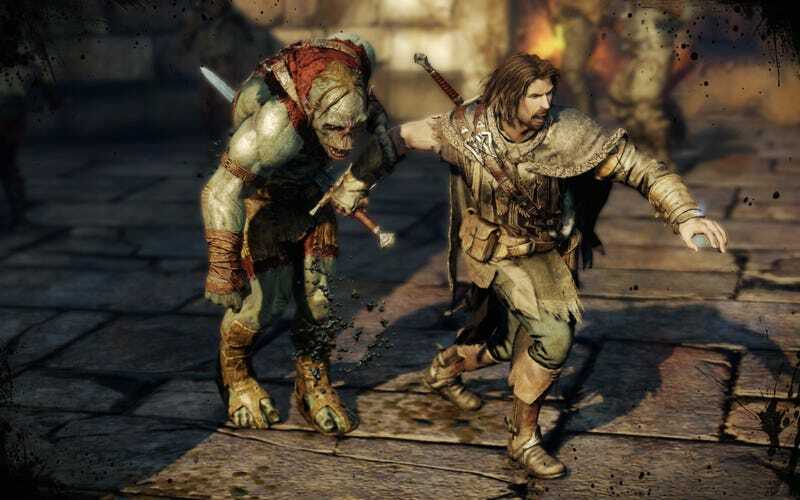 Middle-earth: Shadow of Mordor swiped the Batman System (as we'll call it), and it's a better game for it. As relentless as the base enemies are and as frustatingly common the ambushes by captains can be, a quick escape route made possible by simple defensive actions and strategic maneuvering are an absolute must. The executions and crowd control moves are easy enough to pull off, but they require a certain finesse to use them most effectively. This control layout is clean and deceptively simple. It allows for a great degree of strategy and demands a less rigid mindset. It should be the standard in the industry, much like Halo set the standard for console FPS controls. It's simple, and gives the satisfaction of having your player-character actually do the amazing stuff you expect them to do, much like no-bake cookies are easy to make yet are oh so delicious. My name is Brandon. I used to watch my aunt and my mom play Frogger while I was a baby, and I've been a gamer ever since. My paying job is as a librarian. I currently write Library Journal's "Games, Gamers, and Gaming" column so that librarians all over the nation are informed about games and gaming culture. I'm on Twitter and Steam as level250geek, so feel free to look me up.